The Kautz is a more challenging route than the standard Camp Muir / Disappointment Cleaver route and sees much less foot traffic. I signed up with IMG for a Kautz EX trip (an extended five and a half day trip versus their regular four and a half day trip) way back in February. 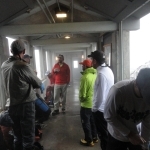 I chose IMG because I wanted to maximize my time on the mountain and liked that the cost included group gear and breakfast and dinner on the mountain. We started Sunday afternoon at their headquarters in Ashford, WA with general introductions, route info, and a thorough gear check. There were 8 clients total and four guides, which made for a nice 2:1 ratio and three-man rope teams. Our lead guide was Mike Haft, and accompanying him was Sheldon Kerr, Dustin Balderach, and Nick Laws, a really great, knowledgeable crew. I stayed in IMG’s “Advanced Basecamp” which is essentially a tent city on their property in Ashford. Pretty nice accommodations all things considered, with a large tent, comfy cot, AstroTurf floor, cot-side table, and lantern. [singlepic id=31 w=540 h=405 float=center]Monday morning’s itinerary had us venture up to Paradise for their “Advanced Mountaineering Day School” which ended up being pretty basic stuff: walking in snow, self arrest, crampon use, traveling roped up, running belays, etc. Nothing really new here for me, but it was nice to just be up on the mountain in the snow and to get to know the rest of the team. The weather was cloudy, and the summit never came out, but at least we didn’t end up getting any precipitation as expected. Monday evening back at HQ we divided up all the group gear: IMG supplied the tents, stoves, cooking gear, and all the breakfast and dinner foods. The shared gear ended up being pretty heavy despite divvying it up, but in the end my total pack weight, including water, ended up being 44 lbs. We awoke Wednesday morning to be greeted with outstanding views above the lower cloud deck, with Mount Adams, Mount Hood, and Mount St. Helens all peeking out. We had a selection of breakfasts provided by IMG, from hot oatmeal to cold cereal. After eating and topping off our water bottles, we packed up and began our ascent to high camp. We basically followed the ridgeline from the Lower Castle up to the Turtle snowfield, passing through a few rock/dirt/scree slopes with our crampons on. We had great sunny weather all morning and climbed 3,000 feet to arrive just below Camp Hazard in the early afternoon. 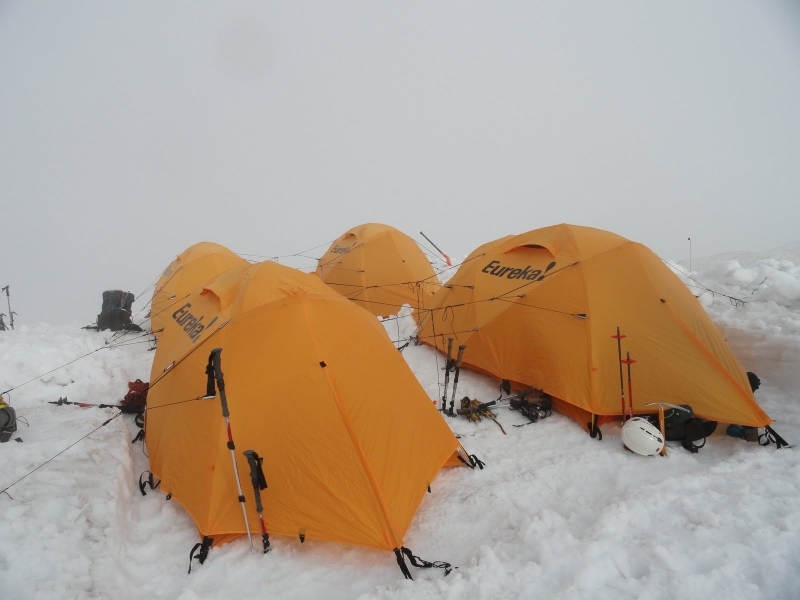 At this point the guides scoped out an appropriate (and somewhat protected area) given the forecasted high winds. [singlepic id=37 w=540 h=405 float=center]We opted for a site on the sloped, leeward side of a ridge at about 11,100 feet that we had to dig out. The guides started it out, but all of us chipped in some form or another over a the couple hours we spent cutting through the icy slope and creating a flat platform large enough for our four tents. It was not easy work but we got it done around 3 o’clock. The guides cooked up another awesome meal and then went out to scope out the Kautz ice chute, the more technical part of the climb. We all turned in for bed around 7pm, anticipating an alpine start between midnight and 4am, contingent on the weather. That evening the winds really started to pick up. Some had difficulty sleeping, though with earplugs in I actually had a pretty restful night of sleep. Thursday: Mike, our head guide, had been getting up every hour since midnight to check on the weather in hopes that the winds would cut out. But they never really did. 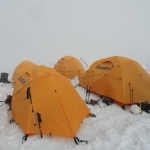 By six in the morning when he addressed the group from within our tents it had also started precipitating with whiteout conditions. 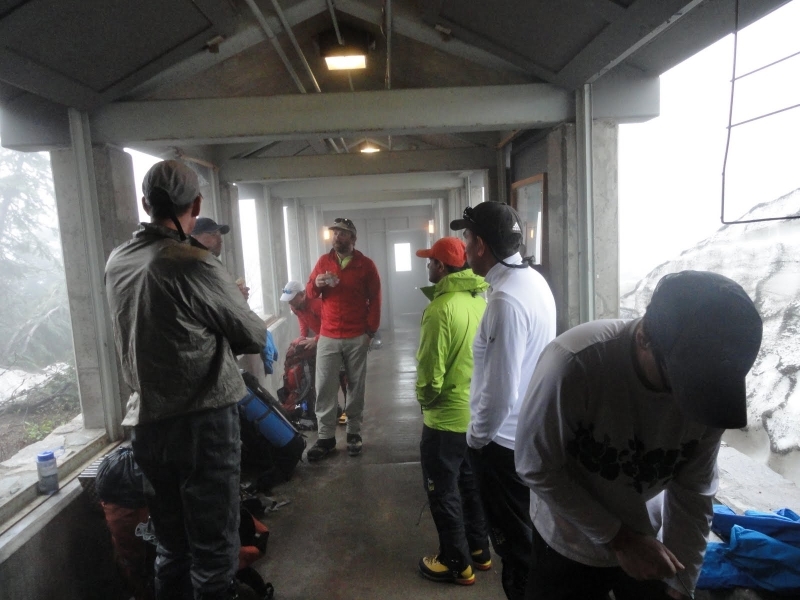 Windy, wet, and whiteout–none of which bode well for a summit. We all held out hope, and waited it out in our tents. In our tent we shared old photos from previous trips on our cameras and I read the sidebar info on my Mt. 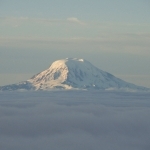 Rainier map a couple times. By 10am or so it became clear that the winds weren’t dying anytime soon and that the summit attempt was no longer feasible given our timeline. Nick was in our tent and started cooking up hot drinks and a lunchtime soup for the whole crew on four Whisperlite stoves attached together in our vestibule. By about 1pm folks were getting a little stir crazy sitting in the tents and started to venture outside. Thankfully by this time the clouds and precipitation had cleared, and now we at least had blue skies to go with our raging winds. [singlepic id=39 w=540 h=405 float=center]Rime ice coated the tent guylines and anything else left outside, which was a pretty cool sight. The winds would seem to stop but then come back with a sudden vengeance as they attempted to rip the tents off the mountain. Some gusts would nearly knock you off your feet. Ascending a steep ice chute (or for that matter, descending or arresting a fall in the chute) would have been extremely challenging with the severity of the winds. On Friday we had a day seminar on knots and ropework at the IMG HQ at about 9am. Mostly review for me, but I also picked up some slick new tips and tricks from the guides which was fun. Also got some additional practice setting up crevasse rescue systems which is always good to review! We wrapped up around 4pm when the guides got us together to present certificates and had us fill out evaluation sheets so we could get our free t-shirts. So, we weren’t able to summit, which is a disappointment, and we ended up spending more nights in Ashford than on the mountain, which is a bummer. But it was still a great trip, with a great group of folks. 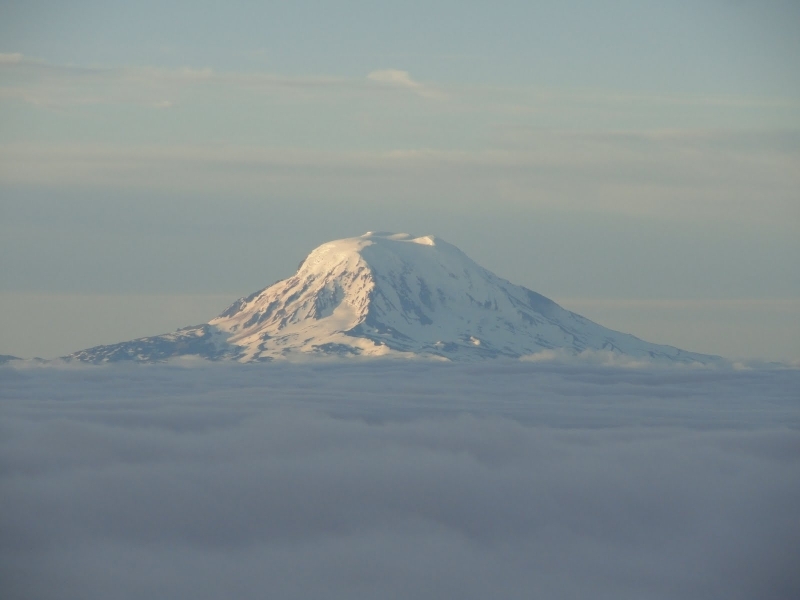 Mount Rainier is a truly amazing mountain, and I have no doubt I will get back there again for a summit attempt… Although I’m now trying to decide in what form: whether with another guided climb, or finding something with a smaller group? Via the same route, or something else? I’m not sure at this point, but I will continue to explore my options in the coming months… Any comments, recommendations, or insights are welcome!